Is snowshoeing fun, you ask? Well, the best we can say is it depends on you. If you hike a lot during the big three seasons, you’ll most certainly enjoy snowshoeing. With the right snowshoes, you can access the trails normally inaccessible in winter due to the deep snow. Also, if you’re much of a nature lover, we’re pretty sure you’ll like snowshoeing. There’s nothing more fascinating than the vast winter wonderland that you’ll get to explore when snowshoeing. It’s so quiet and peaceful. Everywhere you look, you see the land is sleeping tucked under a thick blanket of white snow. Many athletes, runners, and those who work out regularly also resort to snowshoeing as a mean to stay fit in winter. Despite being an easy sport, snowshoeing is famous as a heavy calorie burner. It’s a great cardio workout. According to SIA, snowshoeing burns nearly 50% more calories in comparison to running and walking at the same speed. So, if you hate the thoughts of gaining massive weight in winter, snowshoeing is totally worth a shot. Snowshoeing Is Easy: There isn’t much thing to learn before you can enjoy snowshoeing; only a few basics and a bit of getting used to. Compared to skiing and snowboarding, snowshoeing is far more intuitive. I’m sure you can figure it out after thirty minutes of walking. Probably, the only thing that you’ll find difficult is strapping on the snowshoes. But even that will take 15 minutes tops to get done. Snowshoeing Is Safe: When it comes to risk of injury, snowshoeing is relatively safe. The wide platform offers great stability on uneven grounds and powdery situations, even without poles. Also, since you will just walk the entire time, the risk of crashing into trees and other snowshoers is absolutely zero. The only risk you need to be aware of when snowshoeing is avalanche and getting lost, but that’s only if you break the trails and wander off into the backcountry. Snowshoeing Is Cheap: First off, you can snowshoe everywhere (assuming the area allows snowshoers). You don’t need to get to high grounds to start, so lift ticket is not necessary. Secondly, while you can spend more than 200 bucks on new snowshoes, you can always wind up with a good pair for dirt cheap rate at rentals. As for the supportive gears like poles, boots, and clothing, you can use the ones you usually pick out for hiking. Snowshoeing Is an Awesome Cardio Workout: Don’t get the wrong idea about this easy activity. Although it involves mainly walking, it proves to be an intense cardio workout. 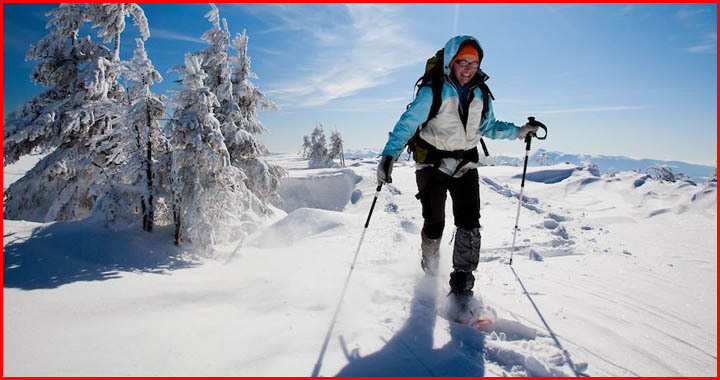 The weight of the snowshoes and the depth of the snow provide great resistance for your muscle. Don’t be surprised that your body temperature will rise off only after twenty minutes. Snowshoeing Is Completely Versatile: The best thing about snowshoeing is you can decide how it’s going to turn out. You can make it as competitive or as leisurely as your heart desires. Want it to be more intense? Climb uphill, tackle those steep slopes! Want it to be a relaxed and laid back walk? Explore the flat terrain around the resort. Your snowshoe outing can be either a solitary journey (always bring one or two friends, never go alone) or a merry trip with friends and family and kids. It’s all up to you. So, is snowshoeing fun? You decide! why should you snow shoe?